[0:34] <ryao> Does the Raspberry Pi use high memory in the kernel? [0:36] <ryao> ShorTie: I mean addresses above 1GB, which need to be treated specially. [0:37] <ShorTie> if it only has 512 megs, how can it acess > 1gig ?? [0:39] <ryao> That does not mean that it is all mapped contiguously. [0:40] <ryao> ShorTie: Basically, the page at address X can be mapped anywhere, 0, 1, or more times. [0:40] <Mortvert> ryao, still, there's no need for highmem on pi? [0:40] <ryao> Is there a channel for kernel hackers? [0:40] <ryao> Mortvert: Most likely not, but I want to confirm that there is no high memory. [0:41] <Mortvert> higmem is more than 2 gigs, no? [0:41] <ryao> I also want to ask if anyonw can explain why initramfs support breaks when vmalloc is set to a value above 192M. [0:42] <ryao> High memory refers to the user/kernel split. [0:43] <ryao> If something is in high memory, it means you need to map it into low memory to access it because trying to access it directly will read from userland. [0:43] <ryao> Assuming you do not page fault in unmapped memory. [0:44] <ryao> There is some address space set aside for such mappings. There is also address space set aside for kernel virtual memory. [0:47] <j4jackj> Vostok: what does lops lops lops mean? [1:49] <> can you describe in more detail how you're loading the initramfs and how it breaks? [1:57] <ryao> : I am loading the initramfs via config.txt. Increasing vmalloc above 192M (default) on the kernel commandline causes the kernel to skip execution of the initramfs and panic. [1:58] <> the pi is a 512MB one? how much GPU memory? [1:58] <> is the kernel image compressed? [1:59] <> at which address are you loading the initramfs? [1:59] <ryao> Where name is the filename. [2:00] <> hm, without the second argument? [2:02] <ryao> : That is the commandline. I am referring to the field in the struct passed from the bootloader to the kernel. [2:03] <ryao> : Ignoresa. It sounds like your cmdline is hardcoded. [2:03] <ryao> : It sets it if you do nto specify an address. That is how the kernel is managing to boot without that information in the kernel cmdline. [2:04] <ryao> : It has not yet. [2:05] <> another option, which is what I'm doing currently (and which avoids a whole lot of possible problems) is integrating the initramfs into the kernel image. is that an option for you? [2:06] <ryao> : Yes, but I would rather avoid it. I guess I ould try that and see if vmalloc=256M works. Thanks for the idea. [2:08] <Wolfram74> quick question, can only one of the pins be used as output at a time? [2:14] <> can you pastebin the full script? [2:21] <> you're referring to that for i in range(20) loop? [2:54] <Wolfram74> have any familiarity with the GPIO pins? [3:10] <j4jackj> Does the RPi support UUCP? [3:13] <ryao> j4jackj: Why wouldn't it? [3:19] <steve_rox> any interesting projects going on? [3:41] <ryao> steve_rox: I am working on getting Gentoo Linux running on the Raspberry Pi with a ZFS rootfs. [3:50] <ryao> steve_rox: What do you mean? [3:50] <ryao> steve_rox: Most people using the Raspberry Pi use ext4. This replaces that with ZFS. [4:01] <ryao> steve_rox: Yes. ZFS is a superior filesystem. It will be nice to use it as the rootfs on the Raspberry Pi. [4:02] <ryao> steve_rox: Some neat things about ZFS are that it eliminates fsck and it can transparently compress files. It also uses the ARC page replacement algorithm. [4:03] <steve_rox> if it eliminates fsck whats used to repair the file system? [4:04] <ryao> steve_rox: The filesystem is a giant merkle tree with duplicate copies of metadata. It can heal itself if it gets damaged. [4:04] <ryao> steve_rox: If there is anything it cannot heal, it will name the casualty and you can move on. [4:06] <tzarc> RAM will be a problem. [4:06] <ryao> steve_rox: You can do a scrub to catch anything that is corrupted. [4:06] <ryao> tzarc: Not really. [4:08] <j4jackj> does anyone here run UUCP on their Pi? [4:09] <PhotoJim> I don't think many run UUCP much anymore, but it should run just fine. [4:09] <j4jackj> PhotoJim: will you run it? [4:13] <PhotoJim> what's your connection? dialup? [4:23] <PhotoJim> so you're using TCP transport for UUCP, not serial? [4:25] <ryao> PhotoJim: Throughput wise, TCP/IP would be faster by leaps and bounds. [4:25] <PhotoJim> it would be, just not sure if UUCP can take advantage of it. [4:25] <PhotoJim> I'd think it ought to be able. [4:25] <PhotoJim> but maybe not. [4:26] <PhotoJim> in its day 9600 bps was considered to be a fast link. [4:29] <PhotoJim> I'm out of the country at the moment. but if you don't mind it being a day or two from now we can chat about testing it. [4:30] <j4jackj> Out of what country? Also, I need to know whether dialup over VoIP is possible, let alone plausible. [4:31] <PhotoJim> I live in Canada. I'm in the US right now. [4:31] <j4jackj> PhotoJim: Phreaking phonespace! [4:32] <PhotoJim> I find it finicky but possible. [4:32] <ryao> tzarc: Please highlight me in the future... I am in multiple channels and if I am not highlighted, I might not see responses should someone else keep highlighting me. [4:33] <j4jackj> PhotoJim: how does one make an ATA out of spares? [4:33] <PhotoJim> j4jackj: I just buy cheap Linksys PAP2Ts off eBay. I have about 5 of them. that'll last me a metric lifetime. [4:33] <ryao> tzarc: Anyway, ZFS performance does not really require a large amount of RAM. That is mostly a myth. There are some deficiencies that make running ZFS on the Raspberry Pi somewaht challenging, but those have to do with virtual address space. [4:34] <ryao> tzarc: Anyway, I am hacking on it. [4:34] <j4jackj> PhotoJim: and they support G711u? [4:35] <PhotoJim> j4jackj: they do but I have a niggle that only one line of the two can do 711u at a time. I'm not positive that's 711u that has the limitation though. [4:36] <j4jackj> I'll need about 4 then... but anycase, if I get it to work it will only use G711a. Why? Because alaw is THE international trunk standard. [4:37] <PhotoJim> the PAP2s are nice but they may not be the best. I like them because I know them. [4:37] <PhotoJim> they work well for voice . and I have at times had good luck with them for data. [4:38] <PhotoJim> not fax, v.34 modems. [4:38] <j4jackj> thing is I want to emulate dial up over VoIP, for a laugh. [4:38] <PhotoJim> well v.90 but you can't do v.90 speeds when you connect to another normal analog modem. [4:38] <PhotoJim> I've done serial console connections over VoIP. [4:39] <PhotoJim> depending on line quality I sometimes have to slow the data rate down quite a bit, but it can and does work. [4:40] <PhotoJim> if you want modems, get US Robotics Courier v.Everythings. they're awesome and they're cheap now. [4:40] <PhotoJim> they are, to be honest, quite large, though. [4:40] <PhotoJim> Courier v.90 and v.92 are best, but for your applications, they will work as will a v.34 one. [4:44] <j4jackj> Are you sure I won't get a line that's marginally 53.3k quality? [4:48] <PhotoJim> and you need special hardware, not normal modems. [4:52] <j4jackj> Are there any VoIP to ISDN emulators? [4:53] <PhotoJim> Not that I know of, but ISDN has higher bandwidth than VoIP does so I'm not sure it would be easy to emulate. [4:58] <PhotoJim> Not sure, to be honest. I'd be interested to find out. [4:59] <j4jackj> Is v90 outbound possible at all? [5:02] <PhotoJim> yes, it's really just v.34. [5:03] <j4jackj> does v34 support 48k? [5:04] <j4jackj> or is that v90's exclusive reserve? [5:04] <PhotoJim> v.90 is 56k from the ISP max., 33.6k up from the customer max. [5:04] <PhotoJim> v.92 is 56k/48k max. [5:04] <PhotoJim> but v.92 was never super-widely deployed. it came just a little too late. [5:06] <j4jackj> is v92 48/48 even possible over G711a? [5:08] <PhotoJim> j4jackj: if the other end has v.92 hardware and T1/ISDN, then theoretically yes. [5:09] <j4jackj> why doesn't v92 support full POTS operation? [5:10] <PhotoJim> it does, but it's limited to v.34 speeds. [5:10] <PhotoJim> that's always been true. [5:11] <j4jackj> or is there one? [5:11] <PhotoJim> if it's POTS on both ends, 33.6kbps is the best youc an possibly get. [5:11] <PhotoJim> it's not possible. [5:11] <PhotoJim> v.92 can essentially slow down the download bandwidth to let the other end have more upload bandwidth. it's bandwidth-shifting, really. [5:12] <j4jackj> that's just over half the bandwidth. I guess echo cancellation comes into play here. So if you attempted to use v92 over VoIP, it would work if you turned echo cancellation OFF, would it? [5:13] <j4jackj> since VoIP-to-VoIP is nigh echo-free, is it not? [5:13] <PhotoJim> no, not echo free, for sure. [5:14] <PhotoJim> I suppose maybe, if you could keep it within a single VoIP system and not route it via POTS or other VoIP providers. Maybe. [5:14] <PhotoJim> you're talking about redesigning analog modems when most people don't use them anymore though, so there would be very tiny demand for the finished product. [5:16] <j4jackj> Maybe V44 with V34 could work? [5:16] <j4jackj> Or would we have to GZIP? [5:16] <j4jackj> I'm happy with streaming GZIP. [5:17] <j4jackj> If it makes my modems faster. [5:17] <PhotoJim> v.44, good question if it will work with v.34. in theory it could if both modems were v.92 modems. [5:17] <PhotoJim> but real world, it's not that big an improvement. [5:17] <PhotoJim> v.42bis works quite well. [5:18] <j4jackj> It will only be going via one ATA, on the same provider (me) and maybe even the same computer. [5:18] <j4jackj> Two accounts for sure. [5:18] <ryao> I wonder if LZ4 is an option instead of gzip... it should make things even faster. It should be possible if you control both ends. [7:03] <Twist-> Morgazmo: do you just need it to run once on boot, or each time the galaxy pairs? [7:04] <Morgazmo> Twist-: so far at least once on boot. haven't tried breaking the connection and repairing, but I shouldn't need to much either..
[7:07] <ShiftPlusOne> Sounds like more of a pulseaudio config question. [7:10] <Morgazmo> ShiftPlusOne: I tried having a script in the init.d directory - didn't seem to work (but I did have sudo in front of the command) - suppose I could try that again. Also, my pi boots into Raspbian GUI, but it's not necessary. Can I have it just boot to command line to speed things up? [7:11] <Morgazmo> ShiftPlusOne: Cheers - will do. [7:11] <ShiftPlusOne> I don't think this is the 'right' way to do what you want, but have you tried putting that command in /etc/rc.local ? [7:16] <Morgazmo> ShiftPlusOne: Trying now. Removing sudo from my script didn't help. Appended the command to /etc/rc.local and disabled X - Still needed to run the command to make it pipe the audio correctly..
[7:17] <ShiftPlusOne> I don't know enough about pulseaudio to be able to help, sorry. [7:18] <Morgazmo> ShiftPlusOne: No probs - cheers, will keep at it. [7:23] <johnc-> anybody know why my libc6-dev header files appear to be missing a single file? [9:14] <mattwj2002> is there any plans of a raspberry pi C? [9:14] <mattwj2002> why not ShiftPlusOne? [9:14] <ShiftPlusOne> at least none that have been publicly mentioned, discusses or hinted at. [9:15] <ShiftPlusOne> because they are focusing on getting the most out of current hardware and also on the education aspect of things. [9:16] <ShiftPlusOne> the current pi meets their requirements. If you want something like a pi, but more powerful and expensive, there are already boards like that out there. [9:17] <ShiftPlusOne> look up beaglebone black, cubieboard and odroid. [9:18] <ShiftPlusOne> O_O frustrated? Not at all... sorry if I gave the impression that I am frustrated. [9:21] <Xark> mattwj2002: We will have to wait and see. My guess would be keep similar cost but increase capabilities in the future. [9:21] <ShiftPlusOne> the foundation will do whatever they can at the given price point.... at this stage, there isn't any wiggle room. [9:26] <Xark> Has anybody here attempted an IR filter-ectomy on their Pi camera? [9:29] <mattwj2002> RaspberryPi's purpose is education of our young people right? [9:30] <ShiftPlusOne> yup, by being a cheap computer they can have in their rooms... since people tend to get paranoid about letting kids mess around with the family pc. [9:32] <mattwj2002> but does anyone remember Tandy Color Computer 2? [9:32] <mattwj2002> raspberry pi reminds me of that! [9:33] <Xark> mattwj2002: That is the plan. Have it be kind of like a C64 or whatnot that you can flick on and mess with. [9:33] <Xark> mattwj2002: Yes. I programmed for the CoCo 1 for a bit working at DataSoft (for a database in a cartridge). [9:37] <mattwj2002> what is that about history repeating itself? [9:37] <Xark> ShiftPlusOne: With a fast booting SD card? [9:38] <ShiftPlusOne> Xark, Yeah, I believe the plan was to keep everything in the initrd image. [11:12] <konfiot> o you know how I can do that ? [11:27] <Dooley> Does anyone know how the unit "AT" works for magnetic switches? [11:31] <ShorTie> got a picture of it ?? [11:36] <Dooley> is it related to the value in tesla? [11:38] <ShorTie> you ever see those switches they put on doors and windows for an alarm ?? [11:45] <ShorTie> what is the applacation for it ?? [12:34] <skoushik> Hello. I wanted to know how the resolution is decided when an RCA cable is used for the display ( an analogue TV). [12:45] <gordonDrogon> you'll get up to 720xabout 480. [12:45] <gordonDrogon> I got 640x480 on an old monitor. [12:45] <gordonDrogon> the vertical resolution will be more critical on the TV you use. 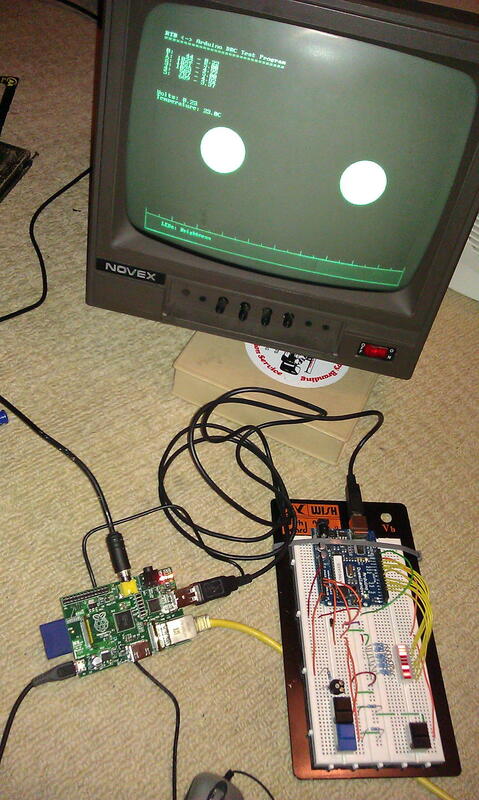 [12:51] <gordonDrogon> http://unicorn.drogon.net/piduino.jpg <- picture of Pi using compost video output - resolution was 640x480 there. [13:01] <skoushik> 640 x 480 is not bad.. I got something lower than that. [13:34] <john_perl> how to run it ? [13:39] <ShiftPlusOne> john_perl, have you edited ld.so.preload in the image? [13:40] <ShiftPlusOne> Does it boot and then go into a loop, or does it not start at all? [13:42] <ShiftPlusOne> yeah, that's the ld.so.preload issue. [13:42] <john_perl> how to fix ? [13:42] <ShiftPlusOne> Did you use xecdesign.com/qemu-emulating-raspberry-pi-the-easy-way/ to get that far? [13:43] <ShiftPlusOne> No, I am just asking if that's what you used. Since the launch command you used is identical. [13:44] <ShiftPlusOne> but if you used that page, you managed to miss the big bold text at the top and I am wondering if maybe I should put that text somewhere else or try to make it more prominent. [13:45] <ryao> ShiftPlusOne: Cool. I did not realize it was so easy to emulate the Raspberru Pi with QEMU. [13:47] <ryao> I wonder if it runs faster in QEMU than on actual hardware. [13:47] <ShiftPlusOne> It doesn't quite emulate Raspberry Pi, but it's close enough for testing purposes. Torlus has a proper raspberry pi qemu target on github somewhere, but it's not quite there yet. [13:48] <ryao> chithead: I did not realize that the CPU had a target. [13:49] <chithead> except for qualcomm, all arm cpus are based on a small number of designs that come from arm ltd.
[13:57] <john_perl> Oh!! ld.so.preload issue. [13:57] <john_perl> it is working now. [16:47] <aktomariel_2012> can any halp me ? [16:54] <Shakaz> is a micro usb required to charge/power the raspberry pi? [16:57] <plugwash> the original "chargers" (they aren't really chargers, the actual charging circuit is in the phone itself) supplied with most smartphones from reputable brands should be fine. "Chargers" sold on ebay direct from china or sold in small asian-run phone shops are much less likely to be fine. [17:10] <Shakaz> plugwash, do powered usb hubs require mains power as well? [17:12] <plugwash> Powered hubs will require a power connection , that is what makes them powered ;) usually the power adator is supplied by the hub though be aware that bargin basement hubs are often supplied with grossly inadequate power supplies. [18:05] <gooch> is that normal ? [18:07] <gooch> is that bad for the pi ? [18:07] <ShiftPlusOne> as long as the hub doesn't do something stupid, yup. [18:08] <Pyrat> my hub has been doing it for months, no apparent harm done. [18:11] <Twist-> gooch: you could google up 'backpower raspberry pi' if you want more info. It's a USB spec violation, from what I've read. Hubs aren't supposed to supply 5v to the controlling computer. [18:11] <Twist-> gooch: but I do it too. I just make a point of not using that hub with more expensive computers. [18:11] <Twist-> If a Pi pops, I'll grab another. [18:25] <RavenII> I started compiling at at 1:30 PM yesterday, and by the time I woke up today at around 9, it was done. [18:37] <Twist-> gooch: heh.. many of us have had that moment of confusion, unplugging the Pis power and watching it keep running. [18:37] <Twist-> "wait a minute..."
[18:47] <Twist-> chris_99: obtain project box. apply drill. [18:48] <TLoFP1> but neither of those are on the list of "supported resolutions"
[18:48] <TLoFP1> so why can't I do say video at 2000x500 ? [19:25] <gordonDrogon> give it more power. [19:26] <gordonDrogon> although most USB keys ought to be fairly low power. [19:26] <gordonDrogon> anything on the screen? [19:27] <Rydekull> and from what I've read, this is a "known issue"
[19:32] <mattwj2002> guys my rpi is locking up? [19:33] <SpeedEvil> What power supply do you have it connected to. [19:33] <SpeedEvil> Also, is it currently at the bottom of a pan of boiling chicken soup. [19:35] <SpeedEvil> mattwj2002: might it just be USB stopping working? [19:35] <SpeedEvil> Do you have any usb devices connected to it? [19:35] <Mort> return it if it's still under warranty. [19:36] <mattwj2002> how long is the warranty? [19:39] <mattwj2002> Mort: what do you need for a power supply wattage wise? [19:39] <Mort> I've no idea actually. [19:39] <Mort> I bough a phone charger and it just works. [19:40] <mattwj2002> I have a new one! [19:42] <gordonDrogon> no matter how many amps the PSU can provide, it's all going via the 700mA polyfuse into the Pi. [19:42] <gordonDrogon> so if the usb key (or whatever) needs more than about 300mA (all that's spare) at boot time, then it's going to upset the boot sequence. [19:44] <mattwj2002> so you guys think my rpi is pulling too much juice for the wireless adapter? [19:46] <mattwj2002> as in keyboard wireless adapter? [20:05] <j4jackj> PhotoJim: I wonder, if I compressed a G722 with bzip2, and the filesize went below 50%, would I be able to send G722 over dialup in real time? [20:16] <ParkerR> j4jackj, wouldnt that depend on the original filesize? [20:17] <j4jackj> This is assuming I want to send G722 data real time over a voice quality link. [20:21] <gordonDrogon> isn't G722 only 32Kb/sec to start with? [20:26] <gordonDrogon> Use g729 if you want more compression - the raw data rate of g729 is about 8Kb/sec. GSM is 13Kb/sec. IP overhead via RTP is about 8Kb/sec though. [20:26] <gordonDrogon> latency will be high over dialup though - it's been a long time since I've used it, but ISTR 200-300mS wasn't uncommon. [20:54] <gordonDrogon> j4jackj, what is? [20:56] <gordonDrogon> j4jackj, Ah. G722. ok yes. "HD" audio - I was mistaking it for G726 which is usually 32Kb/sec. [20:59] <mattwj2002> who was I talking to before? [20:59] <mattwj2002> I need to have a word with you! [21:00] <gordonDrogon> solved with a powered hub? [21:01] <gordonDrogon> it's probably sucking too much juice. [21:01] <gordonDrogon> is it a Rev 1 or Rev 2 Pi? [21:01] <gordonDrogon> ok. rev 2. [21:02] <gordonDrogon> so the total limit is 700mA or so. [21:02] <gordonDrogon> mattwj2002, yes - a badly designed wireless adapter. many are. [21:05] <mattwj2002> it might have just died! [21:06] <mattwj2002> what type of warranty does the pi hav? [21:07] <gordonDrogon> depends on the country yuo're in. [21:07] <gordonDrogon> same as any consumer goods I guess. [21:08] <gordonDrogon> With nothing plugged in - just the �USB power do you get the power LED coming on? [21:09] <gordonDrogon> it might not be dead. [21:10] <gordonDrogon> do you have a regular keyboard for it? [21:10] <gordonDrogon> one you can plug directly in? [21:10] <mattwj2002> a usb keyboard? [21:10] <gordonDrogon> thinking: go back to first principles here. Pi, SD card, no ethernet, just power & keyboard & video. [21:10] <gordonDrogon> can you ping it? [21:13] <mattwj2002> gordonDrogon: do you want me to plug in the hdmi and usb keyboard (non wireless)? [21:14] <gordonDrogon> just go through the usual debugging - see if it runs with minimal plugged in, then add more and so on. [21:15] <gordonDrogon> if you have a voltmeter, check the votlage between TP1 and TP2. [21:16] <gordonDrogon> most Pi problems like this are to do with the power supply. [21:16] <gordonDrogon> and I've seen stuff like the Ethernet dropping out, then coming back due to a bad 5v supply. [21:17] <gordonDrogon> vlt, the omxplayer command will generally play files without anything else needed. [21:18] <mattwj2002> is that enough juice? [21:19] <gordonDrogon> in theory yes- however some cheaper ones struggle to maintain full load. OK for charging, not ok for Pi. [21:19] <gordonDrogon> do you have a multimeter? [21:19] <gordonDrogon> or a desktop PC? [21:19] <gordonDrogon> If you have a desktop PC, try powering the Pi from that. [21:19] <mattwj2002> what about a netbook? [21:20] <gordonDrogon> but a multimeter will let you see if there is a power problem. [21:21] <knob> Do I have to install ftp on the rPi? [21:21] <knob> any thoughts on the rPi ftp command? [21:22] <pksato> to "standard" ftp client. [21:22] <gordonDrogon> surprised ftp isn't installed. [21:23] <knob> gordonDrogon, yeah... but it's about to work now! [21:23] <gordonDrogon> seems to be on mine, but I'm not sure if I installed it or not. [21:23] <gordonDrogon> I mostly use scp though. [21:24] <gordonDrogon> one issue with standard FTP is providing a password if running it via a cron script. [21:24] <gordonDrogon> ncftp can remember sites, usernames and passwords though. [21:25] <knob> Any idea how I can... do this? [21:27] <gordonDrogon> pick one of the many FTP client programs to use - I'd suggest ncftp as it can remember passwords, etc. [21:27] <gordonDrogon> or use scp with keys if your remote site allows it. [21:33] <knob> gordonDrogon, ncftp looks pretty nifty. [22:23] <vlt> gordonDrogon: Thanks, omxplayer works fine for basic playback. [22:24] <vlt> Any idea how to get padded black borders for fullscreen video? [22:24] <vlt> (Looks a bit confusing having the task and title bar in the background.